Dating from 18th and 19th century France and England, several examples of sets of measures were collected by Rietz. Following the needs of trade and commerce that erupted from the expansion of markets in the 16th to 19th centuries in Western Europe, reliable weights and measures were crucial to the accounting of foods and liquids as commodities. The measures present in the Rietz Collection would have been used to verify a particular amount of liquid volume. The measuring of both dry weight and liquid volume soon became a matter regulated by the government, in order to avoid theft and inaccuracy. Stamped with official governmental markings of France and England, the vessels in the Collection are cast of pewter and other metals and represent the measuring system of the country from which they originated. CAS Photo/Dong Lin The measures are not graduated but are sets of containers of fixed value. The French measures employ the metric scale, each container inscribed with its value: "Litre," "Demi-litre," "Deca-litre," etc. The English measures, including some examples made of wood, employ the traditional English measuring scale, and are inscribed with values such as "quart," "pint," "half-pint," and "dram." 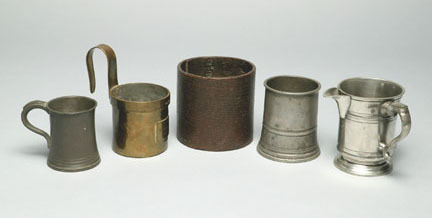 The measures in the Collection were most likely used as tools of commerce, to measure commodities such as milk and cream sold in public markets. Although they resemble modern household measuring cups, these objects predate the common use of household recipes and cookbooks that employ fixed, measured amounts of ingredients. However, it is likely that these tools are an antecedent to household measuring devices.